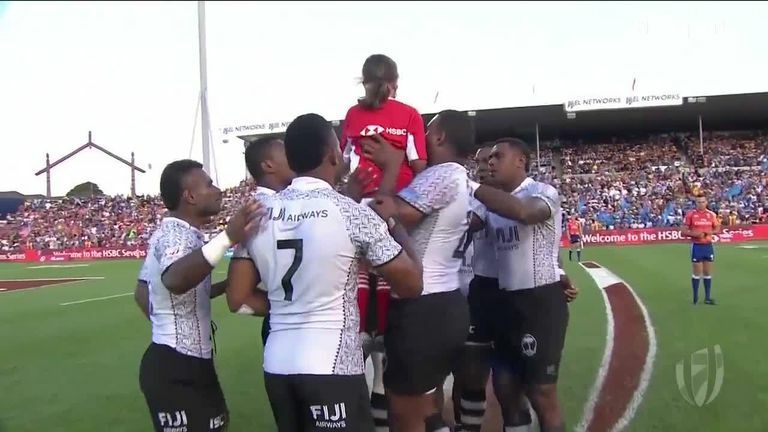 The Fiji players lifted up the ball girl before their cup final in the Hamilton Sevens, and coach Gareth Baber explained after the game why his team did it. Fiji whipped the United States 38-0 in a six-try rout on Sunday to take the New Zealand Sevens crown and draw level at the top of the world series rankings. The winners walked away from Hamilton with back-to-back titles in both New Zealand and the world circuit, once again depriving the US of a tournament win despite making the finals of all three dates in the 2018-19 series so far. Ahead of the final the Fijian players waited for the ball girl to arrive on the field and lifted her up in the air. In the post-match interview after the game, Baber explained his team's actions: "Anybody is part of our family, a ball girl coming in there has as much right to be on this rugby field as anybody else." The HSBC World Sevens Series continues this weekend, with the teams arriving in Sydney for the latest edition. Watch all the action live on Sky Sports.